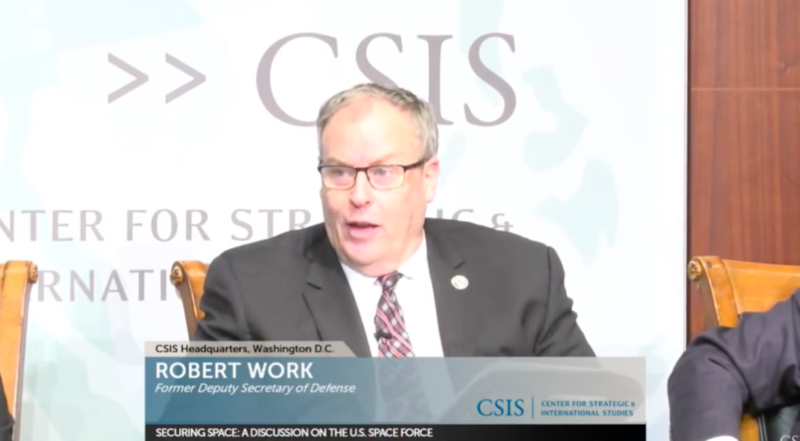 “Whether we get to a separate space force I think is an open question,” former Deputy Secretary of Defense Robert Work said on Monday at the Center for Strategic and International Studies. WASHINGTON — The Pentagon should create a U.S. Space Command, it should do more to protect satellites from attacks and it should change how it buys space technology, a panel of former defense officials said. They are not convinced that a separate military branch dedicated to space is needed, however. And they warned that rushing to set up a Space Force could create more problems than it solves. Air and ground warfare concepts are incompatible so there was a “strategic reason” for separating the Air Force from the Army. “There is no such theory on space power today. Will there be one? Maybe. Is there a foundational necessity for a separate force? I think you have to address this issue” before moving ahead with a reorganization, Kehler said. Another former deputy defense secretary, John Hamre, who is president and CEO of the Center for Strategic and International Studies, said he worries that creating a new service will set off internal power grabs that will distract from the space mission. “When you want to create something in DoD, it brings out the darker impulses in people,” he said. Securing stature and status will take precedence over other priorities, he said. The Pentagon has not yet provided a cost estimate for a new Space Force. Work said the budget is going to be one the most contentious aspects of the reorganization. DoD will add up all the resources allocated today to the space mission, and “if you created a separate space force that would be the initial budget share,” he said. “Is that the right budget share? You would have to debate that.” Budget shares between departments cause ugly fights, he said. Work seemed frustrated by the conventional wisdom in Washington that past administrations did not pay attention to the national security implications of space. When they talk about the Space Force, Trump and Vice President Mike Pence criticize the Obama White House for neglecting this issue.